The Power Couple: Peyton Manning & Gatorade. Have you seen Gatorade’s “Sweat It To Get It” commercials with Peyton Manning? It is a hilarious campaign that focuses on this message: Have you earned this Gatorade? Here is the setting: An actual convenience store, a store clerk, over 15 hidden cameras and Peyton Manning as the manager of the gas station. The premise? You need to be sweating to earn that Gatorade. There are eight of these hidden-camera style videos and each one has over a million views. So, the videos are working; they are going viral. And they are so entertaining. The goal of this campaign, according to TBWA/C/D’s Executive Creative Director Brent Anderson, was to bring people back to Gatorade’s roots. 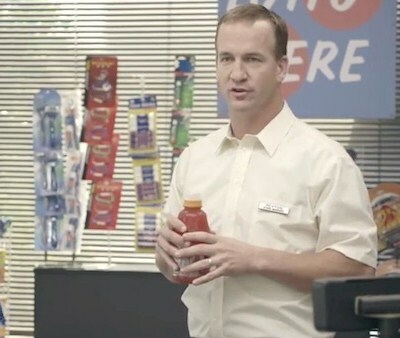 It’s hard to tell what’s funnier; Peyton Manning telling the customers they need to be sweating to buy that Gatorade, or some of the customers having no idea that the manager of the gas station is the Broncos’ quarterback. Peyton Manning has become one of the most entertaining and effective celebrity endorsers. He is talented and accomplished…and has an incredibly appealing personality. Paired with exceptional creative content, he and Gatorade are a marriage made in heaven.